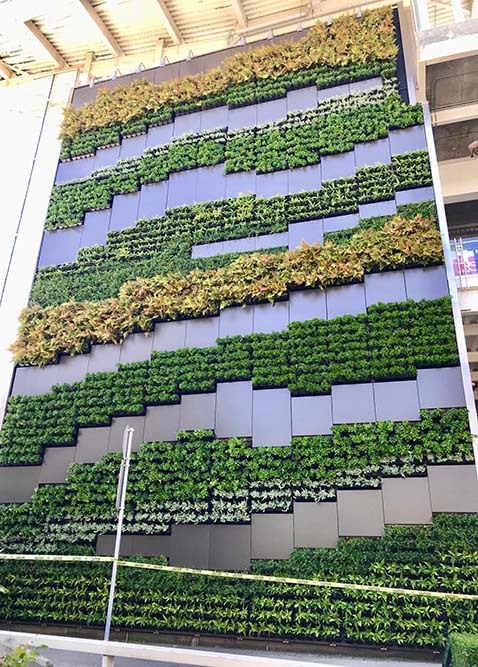 GSky Plant Systems, a manufacturer of interior and exterior green walls, introduces the Versa Wall XT system, an exterior living wall alternative to pre-grown panels. Each Versa Wall XT features 1-gal. potted plants in lightweight trays, allowing the quick and clean replacement of full-grown plants. This system can be a seasonal alternative in colder climates where plants can be removed for the winter or replaced entirely in the spring. The system is easy to install, including around architectural features like doors and windows. Built on the same design as the indoor Versa Wall, the Versa Wall XT features a unique modular design for quick and easy installation and simplified maintenance. With the Versa Wall XT, it is easy to change out individual plants, or exchange a whole wall of plants when seasons change. It does not require wait time for growth. Featuring patented vertical irrigation technology, the Versa Wall XT system cuts water waste and prevents oversaturation. It also boosts cost efficiency by automatically running a timed gravity-based irrigation cycle two to three times per week. The Versa Wall XT enlivens façades, cleans the air and shapes the acoustic environment. 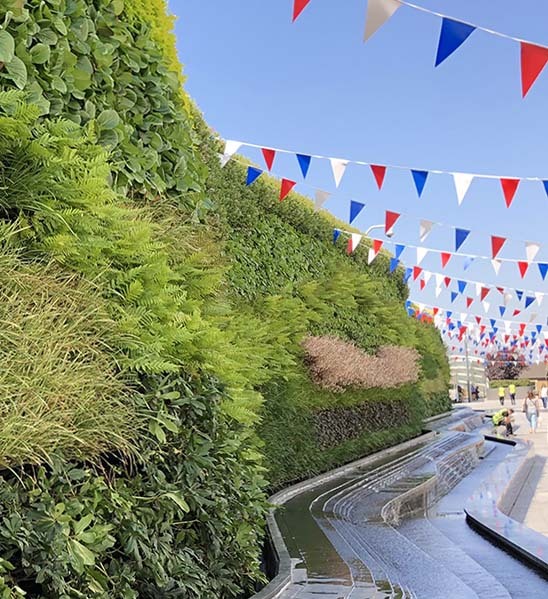 The system also is completely customizable with plants local to the installation site. GSky and its dealer network design, install and maintain all Versa Wall XT systems. This gives customers creative control over a marquee feature that lasts, according to the company. Clients include Proctor & Gamble, Vancouver’s Simon Frazier University and Europe’s largest shopping center at Westfield Mall (London, UK). GSky’s comprehensive maintenance program protects every Versa Wall XT with a highly experienced team of green wall professionals. The program includes hardware coverage and plant guarantees.